Aaron Paterson has once again released one of his most closely guarded secrets to the magic trick world, O.D. (Optical Delusion)! That's O.D. 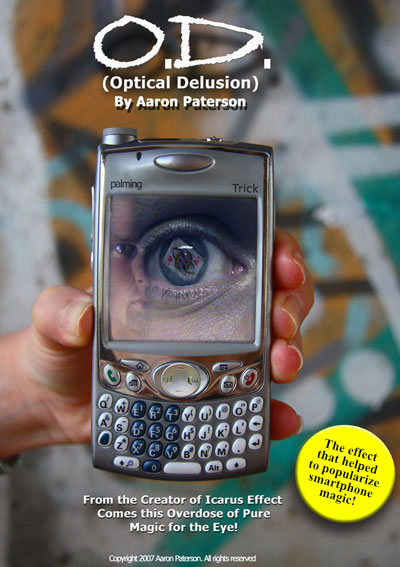 (Optical Delusion) - Magic Trick by Aaron Paterson! Incredible cell phone magic! Includes: Instructional DVD, complimentary access to the exclusive OD forum plus free downloads. Note: While the preparation of the O.D. (Optical Delusion) magic trick is fairly involved, once prepared, OD is easy to perform, practical and ready to go anywhere, anytime. "AARON PATERSON HAS TAKEN card tricks into the 21st century. His Optical Delusion is the best trick I have ever seen with a cell phone." Click on the appropriate PayPal button below to add this item to your secure Paypal shopping cart. US Dollar Price..........................$14.95 + (FREE shipping within the continental USA and Canada).